If this blog had an anatomy, the Wipeout series would be without question the spine; the one unifying thing behind its entire purpose. A great deal of what appeals to me from a design perspective both inside and out of videogames stems from the earliest entries in the series. Luckily, the Wipeout franchise remains home to some of the sharpest graphic and visual art direction in the industry. As is with many games today, and has been a sort of “unwritten rule” when it comes to graphic design, some of the most impressive and dramatic concepts come from Europe. Although the ubiquity and globalization of the internet has proved that great art of any kind can come from anywhere, in the early to mid 1990s Europe was the place for the newest in electronic music, visionary design, and latest trends for the 18-24 demographic that Sony targeted with the original PlayStation. No small wonder that Wipeout, designed by Livperpool-based (that’s in Europe) Psygnosis studios, was a launch title for the PlayStation’s European release in September of 1995. 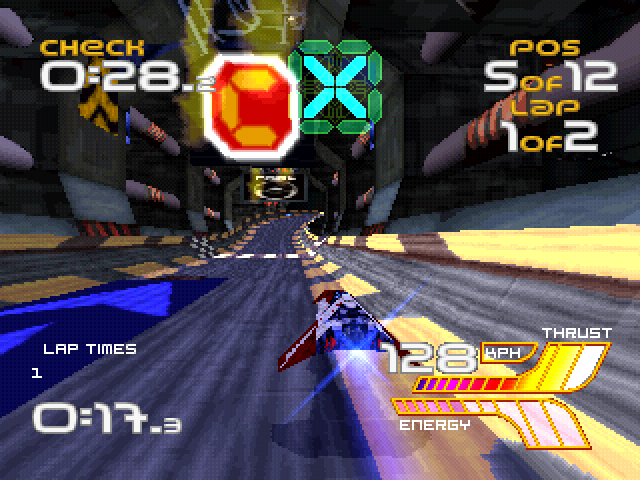 Wipeout marked the first non-Japanese developed game for the console, and quickly became a hit in several territories garnering high-scores in reviews and appealing to an older, more sophisticated gaming crowd. This is one of them “Euro” games. 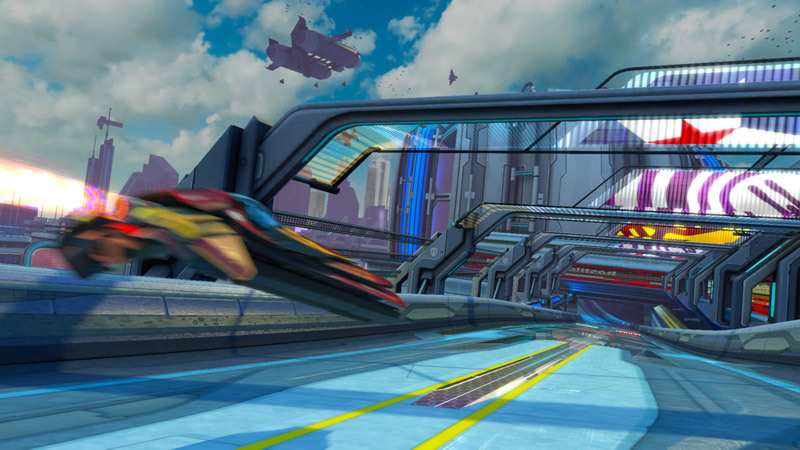 Wipeout shared concepts and elements from other racers of the time like F-Zero, Mega Race, and PowerDrome; a futuristic high-speed racer with tracks that twist, turn and challenge the player with omni-directional design. However Wipeout brought something to the future-racer that had only previously been seen in more “conventional” racers like Mario Kart, RC-Pro Am, and SpyHunter: weapons and power-ups. While a book’s worth could be written about the entirety of the Wipeout franchise’s aesthetic, art direction, soundtrack and impact on the world, for the purposes of this entry I’m going to solely focus on the changing design of the weapon icons as seen in each iteration of the Wipeout formula. No conversation about the origins of Wipeout can be had without mention of The Designers Republic (often shortened to tDR). Founded in the late 80′s by Ian Sheffield to originally create posters for a band he was managing, The Designers Republic found success in the 1990s with a bizarre mix of anti-establishment vision, futuristic aesthetics, and a total embracement of corporate branding and hyper-consumerism. They are one of the most well-known forces in the world of graphic design, and have the respect of designers, marketers, and artists the world over. To this end, tDR’s “maximum-minimum” brand of Russian Constructivist-inspired vector graphics, pseudo-corporations and liberal use of slogans!! are a perfect fit for Wipeout’s future-flung racing world. 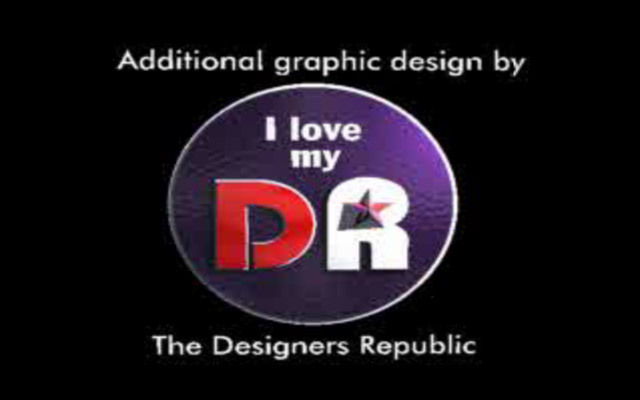 For the first three installments of the series, The Designer’s Republic had a hand in, or outright created, just about every visual element in the game: icons, UI, background art, team logos, racer logos, ship liveries, packaging, marketing materials, etc. 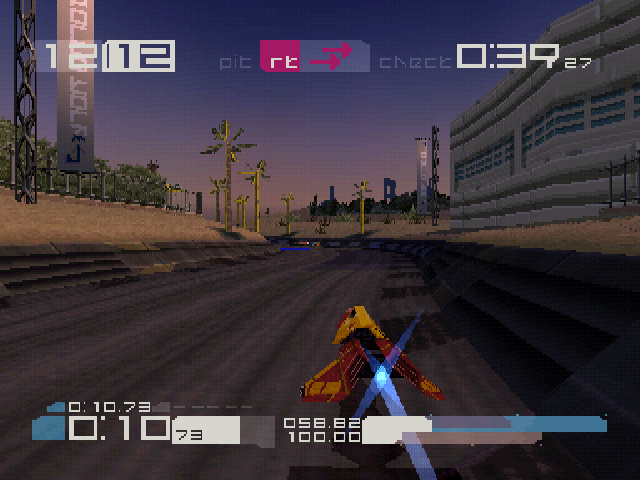 For Wipeout, much of the game’s identity is informed by tDR’s work of the time. Much of the external materials for the game showcases the more complex, detailed, and busy imagery that tDR used across several album covers and designs. Internally however, the game uses the more minimal side of the company’s repetoire; heavily stylized graphics with bright bold colors and bold, wide lines. The weapon icons follow through on this style. Symmetrical circles house each design, created with simple, bold, rounded lines, set against bright colors so as to be easily identifiable to players focused on the race. A few only become sensible after finding out their meaning. Of these, the icons for Turbo Boost, Mines, and Rev-Con are a little muddled. I’ve always thought the Turbo Boost in particular looked “religious” in some capacity, with the lines probably meant to signify the “boosted” jet cone of the ship looking like rays of light coming from some circular deity. Despite this, this icon is my favorite in the game because of its striking black-on-orange color combo. The Mines icon clearly depicts objects of some kind floating in space (like the mines do in-game) but it’s not immediately clear that the central “dot” mine is exploding. Likewise, it’s not totally understandable that the combined + and – signs for the Rev-Con power-up conveys that a player’s control is reversed; the name is more telling than the symbol. Muddled meanings aside, I feel like each of these icons is a work of art unto itself. Moreover, these icons lay visual foundations that stay throughout the rest of the series. Because I am an American, the sequel to Wipeout was Wipeout XL. In any other country, this game is Wipeout 2097. I suppose the folks at Psygnosis were worried about appearing too “Euro” or something because along with the name, the logo changed from a modified version of The Designers Republic’s great typeface to a fat and rounded font. Where the tDR font is genuinely creative and interesting, the font for Wipeout XL and Wipeout 64 looks like a generic “future font” you’d see on a $10 t-shirt in 1998. 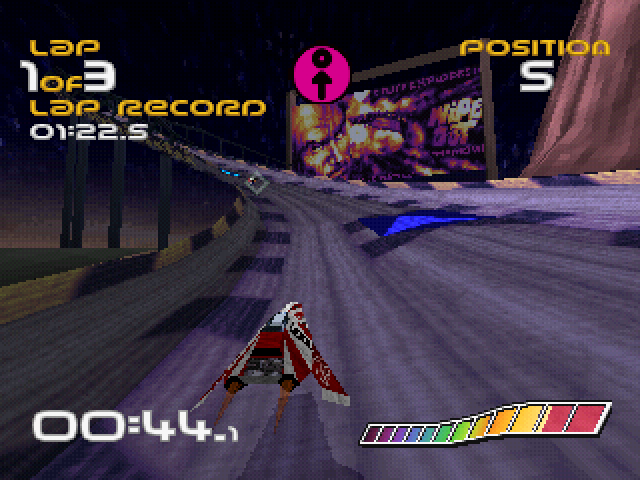 As I said, Wipeout’s identity was largely determined by tDR’s own work of the time. Not quite so with XL/2097. Although the external materials (at least in everywhere-but-the-U.S.) continued with the busy lines, aggressive iconography, bold colors and similar typefaces from Wipeout , the sequel itself took on a more gritty, digital style than its indeterminate “futuristic” predecessor. Likewise, the icons underwent a fairly drastic overhaul. Overall, XL/2097 has a more cohesive visual language. The tracks are a little more industrial in location and construction, the interface is more segmented, a little more informative, and a occupies a little more screen real-estate than its predecessor. Mimicking a LCD panel, the icons for Wipeout XL are made of those familiar stretched hexagons we’ve all seen on things like microwaves, calculators, and digital alarm clocks. 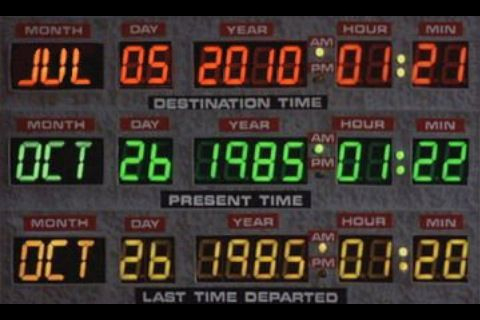 I am constantly reminded of the battered interface panel for the time circuits inside Doc Brown’s DeLorean. Pretty sure this what the inside of an anti-gravy racing ship looks like. Remember I said the words “visual foundation” up there? Also something about The Designers Republic being one of the best design firms of the last 30 years? This is where things start to get interesting (for me). Building upon the visual information of the previous game, many of the returning weapons in Wipeout XL are denoted with icons that much resemble their Wipeout counterparts. It’s interesting to note here that with the more machined and industrial stylings of the game, the icons as a whole have a slightly diminished focus on color. The palette still straddles the rainbow pretty generously, but in combination with shape, size, orientation, and the other elements (like the unlit lines that sit “behind” the icon proper) the coloration has become less of a focus. Like any good sequel, Wipeout XL comes with some new toys. Five new pick-ups were added for this release. Due to the limited working space of mimicking a LCD display, at least one of these icons misses its mark, but makes up for it with an awkward sense of humor. The Autopilot icon is great. Not only does it resemble an “A” shape, but given its orientation in the space appears to be a craft hovering over the track. I will admit that the meaning of this icon is not outright obvious. The Quake Disruptor. It’s a “Q”. For “Q”uake. Lack of originality is made up for by how fun the weapon itself is to use. The Plasma Bolt icon is perhaps my favorite but not because of its design. Used properly, the Plasma Bolt can kill another racer in a single hit. The weapon has a narrow line of fire, does not home-in, and has a rather long charge-up time before firing. It’s almost poetic that this dangerous bit of weaponry is represented by a singular, unassuming vertical line. The Thunder Bomb, represented by an “X”. For e”X”plosion? Possibly, but you could argue that the lines convey the resulting explosion after deploying this weapon. Again, despite the fact that some of these meanings can be a little muddled until AFTER their corresponding pick-up has been used, each of these icons fits right in with all the other visuals of the game. Even the Checkpoint “C” markers have been done in the LCD style. This is the last time we will see a majority of these motifs for the various power-ups in the Wipeout franchise. I’ve never played this game. I also don’t intend to as anyone who regards themselves a “Wipeout purist” doesn’t even consider this game part of the series proper. This is not cause enough to NOT play the game, but from what I understand it’s an awkward amalgamation of the first two entries in the series. However this game does include a few new weapons, called “Super Weapons”, with new icons. I would not think to necessarily include them if I weren’t: A) overly thorough, and B) several of these weapons make re-appearances, albeit re-tooled, in later entries to the franchise. I’m not going to offer much description for these. While Psygnosis developed the game, I can’t say if the new icons or any other new content was developed by The Designers Republic. Given the busy nature of these icons I’m going to wager not, but with only so much space to utilize eventually you have to start piling on the shapes. The Mini Gun icon is interesting if only because it technically existed in XL/2097 albeit the weapon was only accessible via a secret code. I’m not sure it says “Mini Gun” to me, though. Evidence for the case the tDR might have worked on this title: the icon for Qirex’s Power Snare resembles tDR’s long-running mascot Angry Man. The remaining icons seem to be created more of simply running out of ways to creatively position so few number of shapes. I enjoy them from an aesthetic point of view as they create interesting designs, but the commentary on their effectiveness as icons is limited at best. Whereas Wipeout XL was gritty, rainy, industrial, and harsh Wip3out is clean, utopian, and sparse. The Designers Republic paired with Psygnosis a third (and final) time to create what they believed to be a “believable future” resulting in a tone that is vastly different from XL/2097. White birds flock over head, cherry blossoms fall across the track, and everything looks like it’s cleaned about 13 times a day. To complement this change in atmosphere, tDR again revamped the aesthetic for the title. This time, they went minimal. Very minimal. Unlike the slight disconnect between external and internal content as with the previous two iterations, Wip3out’s visual language is unbroken across all formats. The product of this direction is weapon logos that have become so “essential” in their nature that the next step down would be to display absolutely nothing at all. Like the change from Wipeout to XL/2097, many of the icons here rely on visual heritage. Their appearance governed simultaneously by what they must convey, and how they’ve appeared in past versions. Note that we are essentially dealing with 3 colors: maroon, yellow, and an opacity of white. This is a total rejection of the bold “rave emblem” style of the first game and the continued Technicolor palette of XL/2097. Even the use of language has become minimized and truncated: pick-ups are labeled with simple two lowercased-letter abbreviations like “rt” for Rockets and “cl” for Cloak. With the pairing down of complexity and minimal approach of Wip3out, the power-up count was reduced from Wipeout 64′s 16 to 11, including removal of both series staples Electro Bolt and Turbo Boost. The latter as a result of Psygnosis adding a “boost” function to all craft in-game at the expense of shield energy. This is great as it provided room for some new weapons and some all new icon concepts to go with them. Mines! Finally it makes sense to me. Several dots/mines in a row. Perfect. Simple. Rockets, now reduced back to 2 per use, are denoted with straight lines to indicate their lack of any homing ability. Otherwise the two icons would be near identical. Gravity shield. New name, same ability. I really like the notion of the two opposing arrows seeming to “push away” anything that tries to harm whatever is inside the box. Quake Disruptor. I really like this icon as it has a few meanings built into it: the left-half of the line resembles a lowercase “q” shape while using the arrow shape to convey what actually happens when the Quake weapon is fired. Plasma Bolt. Not a fan of this one as it seems to break the minimal rules established by everything else from Wip3out. It certainly lacks the “humor” of its XL/2097 version. The Energy Drain indicator works on two-levels (sensing a common theme here with the tDR icons? ): on the one hand it illustrates that while you gain (+) shield energy, your opponent loses (-) theirs. Additionally, as the Energy Drain initiates an exchange of power/energy, the “+ -” combination calls to mind the positive and negative cells inside a battery. The Cloak icon is a little mysterious to me. On the one hand the use of the square shape is reminiscent of the shield icon, and in this regard Cloak works somewhat similarly (it affects your entire ship). However the square dot contained inside I assume would represent your craft itself, but the configuration of these shapes does not say “cloak” to me. Wip3out is to me, by far, the pinnacle of icon design for the franchise. Several of the icons operate on multiple levels with such tiny amounts of visual information; the ultimate goal for any great bit of iconography. Many of the visual motifs started in Wip3out carry forward into the later iterations of the series including the change from square ratio to a more “widescreen” presentation. Unfortunately, this is also the last appearance of The Designers Republic for the Wipeout franchise. The sun has set on the PlayStation era of the Wipeout franchise. In Part 2, we’ll look at what happens when another design firm whose portfolio at the time was clearly influenced by the juggernaut of tDR and when the newly formed Studio Liverpool takes matters into their own hands. Wipeout, Wipeout XL, Wipeout 2097, Wip3out, Wipeout Fusion, Wipeout Pure, Wipeout Pulse, Wipeout HD © 2011 Sony Computer Entertainment Europe, all rights reserved. Wipeout is a registered trademarks of Sony Computer Entertainment Europe. All works of art depicted and recreated have been done so in an academic pursuit to foster discussion and better understand the process of their creation. Any and all rights are held by their original creators. Visual Attack Formation does not utilize these works for commercial or financial gain. Please contact Visual Attack Formation if you are a representative of a publisher or developer and feel that your work has been infringed upon.